Playing safely in the park for children with disabilities has been getting attention in Taiwan. 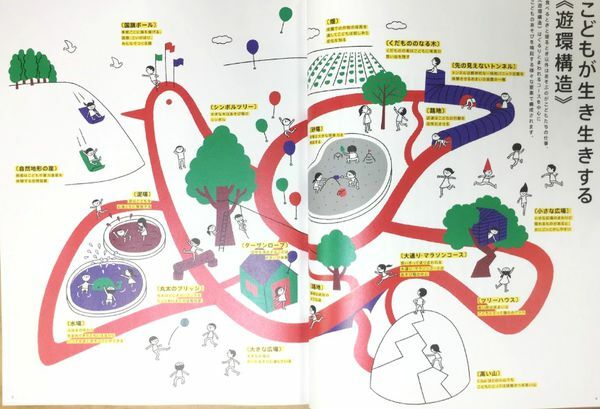 The models of foreign inclusive playgrounds are often taken as examples for designing playgrounds in Taipei City. However, compared to other countries, the land of Taiwan is quite small. What shall we do to overcome this problem? What other foreign designs can be great examples for us to learn from? Photo Provider | Classic Design and Planning Co. ,Ltd. , RunJu Playground Equipment Co. ,Ltd. The instructor of Chung Yuan Christian University Liu Bo-Hong, who is in charge of Classic Design and Planning Co. Ltd., has been an expert in landscaping for years. He has participated in the designs of Dai Gangqian Park, Zhuyin Park Number 4, etc. In the early years, the inclusive playgrounds of Taiwan were usually composed of standardized equipment and playground zoning was more apparent. There was a lack of the concept that children should participate in designing playgrounds. However, in foreign cases, people with disabilities and children took part in designing besides standardized equipment. “ Magical Bridge Playground in California is a great example.” Liu Bo-Hong said. The mothers of children with mental and physical disabilities have raised funds for seven years to build the Magical Bridge Playground. Magical Bridge Playground designed by Palo Alto City Hall is located in sunny California. The fun playground was opened in 2015 for all ages and all abilities. 25,000 visitors visit every month. Magical Bridge Playground is divided into Swinging Zone, Sliding and Climbing Zone, Toddler Zone, Spinning Zone, Picnic area, etc. Most of the equipment in the playground was designed by people with disabilities, designers, and occupational therapists. There was only some standardized equipment bought by companies. 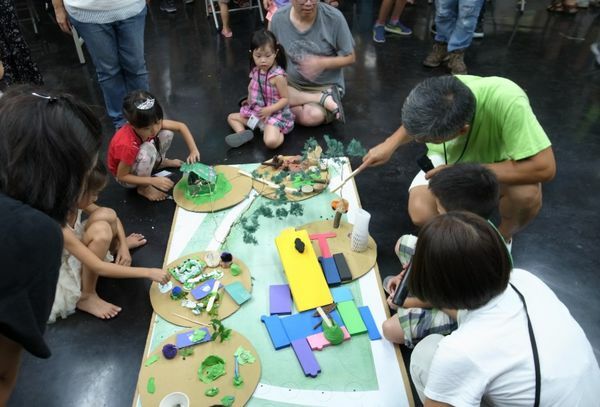 Liu Bo-Hong also points out that the “Play Structures of Circularity” should be the bigger focus apart from giving children the opportunity to participate in the designing process. In 1980, Japanese architect Mitsuru Senda published his paper with a new concept of play structures, the Circular Play System. He suggested that following a circular route to play should bring players back to a natural end of the route. The circular routes could diverse environment and inspire the exploration of children. He even hoped that children could be the main designers because children were born with the inclination to turn spaces into playgrounds. Salamander Playground was built in Montreal, Quebec, Canada in 2009. The shape of the salamander is the symbol of the landscape and the black rocks of the rock-climbing equipment look like the salamander’s eyes. The salamander is divided into several zones with different purposes. It meets the idea of Circular Play System of Mitsuru Senda. It is an excellent playground integrating inclusive playground equipment and the design of Circular Play System. Liu Bo-Hong shared his experience. ”Last time, we had a designing workshop, ‘ My Little Play Island’, in Huashan 1914 Creative Park. We called on some children to participate in designing of My Little Play Island”. We supplied some materials and tools, such as clay, and asked parents to not only allow their children to use their creativity to explore but also understand their children’s motivation for design. 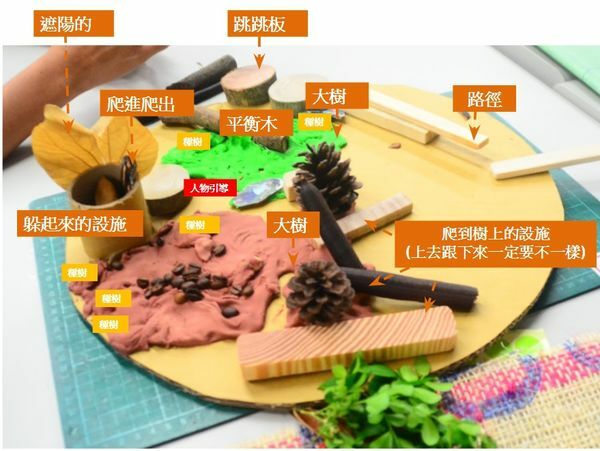 Children have many individual characteristics and brought many creative ideas for the park.Liu Bo-Hong integrated the creative ideas and put them into the park with other related designs. With the new design concept in mind, children are excited to see the outcome. “ The advantage of landscaping inclusive playgrounds comes from the utilization of the natural landscape – not having to create artificial slopes. It allows people with physical disabilities to move freely to where they want to go. Designing with the disabled in mind, equipment should be based on the needs of those people rather than be added at will. For instance, if the slide is set on the hillside, disabled people can move along with the natural slopes up to the slide without being physically limited. Liu Bo-Hong always stresses on the bi-integrating concept not only to include people with all abilities but also to create equipment with various purposes. The Circular Play System creates various playing routes whilst using the same equipment; thus, minimizing land usage. Dai Gangqian park in Neihu is slowly becominga dream park. The 2.5 hectares land of Dai Gangqian park is divided into Natural Zone, Kids Play Zone, Mountain Observing Grassland, Rainfall Garden, and Herbal Square. In Kids Play Zone, there is some natural wooden equipment, such as Log Stack Climber and Log Balance Beam. Besides those, the irregular mental climber allows children to keep climbing on with no end. In the Rope-Climbing Zone, the small tube channel under the artificial grassland can be used as a hiding place for children with Kanner syndrome. The bigger size of the swing seat allows of more people swinging at a time; therefore, the waiting time is decreased. In recent years, under the efforts of PFC (Parks and Playgrounds for Children by Children), who has taken acts with the slogan‘ Say no to the poor-quality and infantilized cookie-cutter playset. Say yes to the inclusive playground equipment.’ , and other volunteering groups, people have been aware of the importance of playground equipment to developing children as well as the equal right for the disabled children to play safely in the park. More and more experts continue to work on these issues. However, the landscape of the parks, the functions of equipment and the playing routes are different across all parks and will change over time. Yet, small moves to help more people understand the idea of inclusive playgrounds will nonetheless provide big changes to this country. The foreign playgrounds mentioned in this article all focus on the playing of children with little aspects of education. However, Mrs. Lin Chia-Hua, who is in charge of Runju Playground Equipment Co. Ltd., showed us another type of inclusive playground -The City of Almeria Spain Playground. 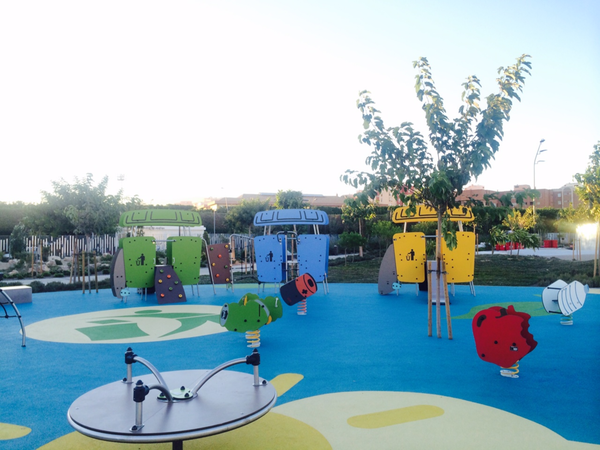 The City of Almeria Spain Playground was opened in 2014 in Spain. Children learn the recycling process through the specific play equipment. On the playground, the recycling marks can be seen on the slides, interactive play equipment, and swings. All the designs are related to recycling issues. 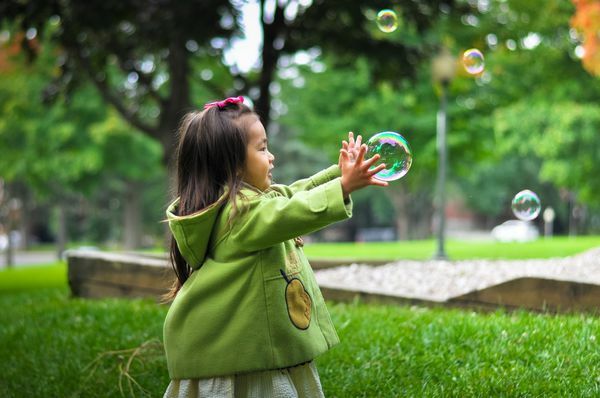 Children can not only have fun but also learn about the importance of environmental protection.